1992 CR250 with all original racing parts. 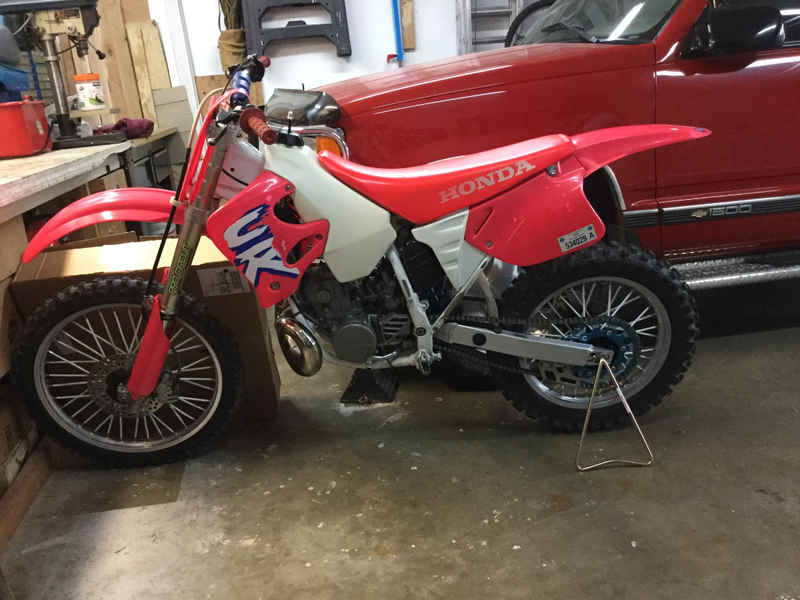 So, I took a trip into the local Honda store recently, had my 1992 CR250 in the back of the truck.. Next thing you knew, there was 3 employees out there looking at the bike. A guy recently had restored the same bike, and was in aw that this bike was in better condition. He told me that to a collector, with the parts on it and hte condition, that it's worth a min of $7500.00. I still don't really believe it, but if that's true.. I will be selling it to get a CR500, since I am a bigger guy... I'll miss her, but a collector would take the best care of her. I've kept this bike in mint condition since I bought it in 1996 for $2400.00. The guy who raced it had just rebuilt the engine, and babied this bike, even above all his newer CR's. Apparently there is about $4k worth of work done to the engine, polishing the insides etc. (dunno, I am not a mechanic). He said that he did a Dyno test on it, showing it to push a little over 50HP (can't remember if he said 55, but I know it's in that area). I haven't changed anything on it, other than the pipe. Went with pro circuit since that's what the suspension / silencer is. Anyways, that's my longer story short... here are a couple pictures for you guys. Any comments and feedback are more than welcome! It's most definitely sweet bike. But I doubt you'd ever get that much. Nevery know tho to the rite person. Hmmmm I got a 96 it's sweet maybe 2500 at most I'd say it's worth. Lol yes for that much id sell any bike. Yes that's great engine for sure.